Magtech has become a name trusted by military, law enforcement and shooters worldwide. 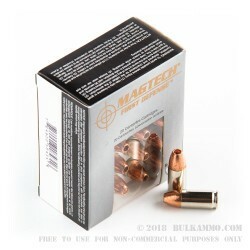 Magtech produces some of the most popular ammunition on the market. Every cartridge is manufactured on new equipment to the highest standards so you get reliable performance shot after shot. Magtech’s First Defense line takes Magtech’s legendary reputation a step further. This defensive ammunition is purpose built for shooters who bet their lives on their equipment. First Defense cartridges are manufactured with 100% copper bullets for weight retention, reliable expansion and solid penetration. Ammunition is rated at around 1300 feet per second for muzzle energy, and 364 pounds of muzzle energy per foot. 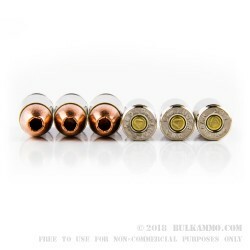 These rounds are loaded with brass cases and are non-corrosive and reloadable. Q: So the EMB style costs less? Which would better suited for a defense round? A: The design of the solid copper hollow points and the method by which they expand make them more suitable as defensive ammunition. Q: Are these suitable for indoor ranges that are "lead free"? 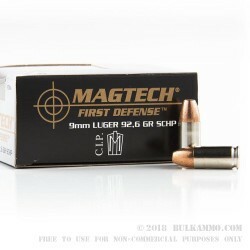 A: These Magtech First Defense SCHPs are definitely suitable for "lead-free" ranges. You might also consider the Fiocchi EMB 9mm ammunition. It's also lead free, but will cost less per round. Q: What are the advantages of using such a light bullet? 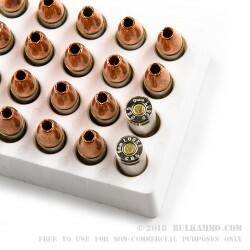 A: Although this Magtech ammunition is loaded with a seemingly light 92gr projectile, the projectile is solid copper, and is thus less dense than lead, requiring a lower weight for a given volume. Because the bullet is solid copper, it does not present the health hazards of lead core ammunition, especially when fired indoors.